Quality 6 Piece Pet Beds. 3 different sizes in 2 different colors. 2 Sets of 3 each (1 set in light checkered pattern and 1 in bright checkered pattern). 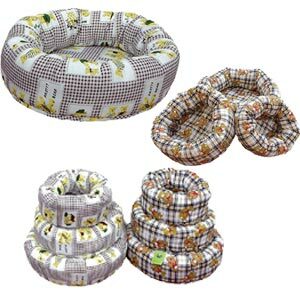 Metro Traders - Donut Bed Assortment - 6 Piece Beds product is categorised under Wholesale - Metro Traders, LLC (Closeout) products, Wholesale Dog Products, Wholesale Beds and Accessories, Wholesale Beds and Accessories.